This is a project that we made this month at my stamp clubs. The image above is of the photo book from the front. It's made of 2 square chipboard coasters that are covered in designer paper (Spring Break DSP). The two coasters are hinged together using the Crop-a-Dile and double-stitched ribbon. 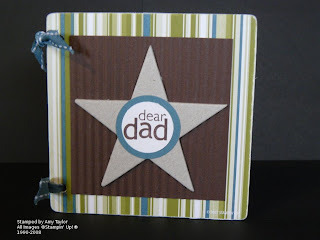 The large star is from the On-Board Simon Upper chipboard and the "Dear Dad" stamp is from the Holiday Blitz stamp set. The square of Chocolate Chip card stock is put through the crimper to give a little texture. Really pretty simple. This image shows the inside of the photo book. The same designer series paper was used (opposite side) to cover the coasters. The small star punch and the photo corners punch were used as well. 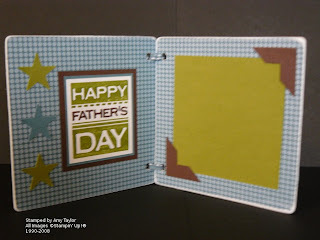 The "Happy Father's Day" stamp is from the All Holidays stamp set.